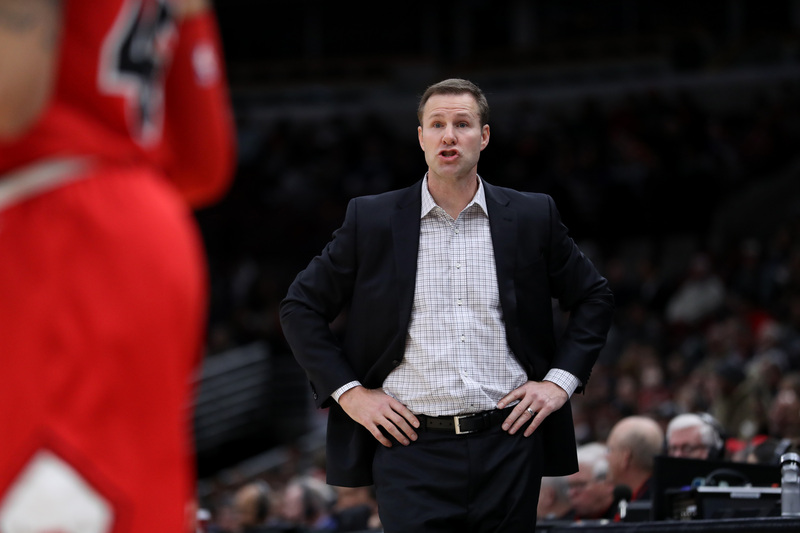 We decided to go back a few seasons and take another look at Fred Hoiberg’s Pitch Series that he brought to the Chicago Bulls from Iowa State. 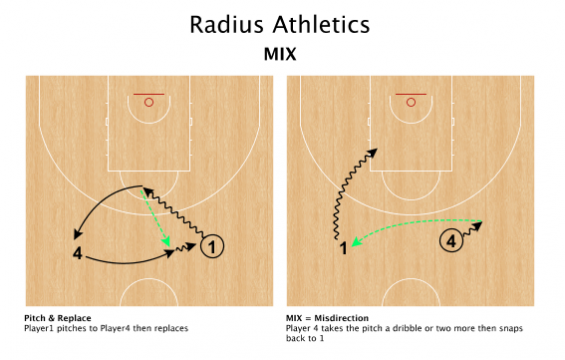 The series features some weave-like ball and player movement, misdirection and both wing and spread ball screens. The dribble pitch to the trailer is the initial action in the clips in the video below. It can be followed with a pass-and-follow wing ball screen or a misdirection or MIX pass. The first few clips are of Pitch Get – a simple dribble pitch into a pass-and-follow wing ball screen. Misdirection is an effective offensive principle. Use the dribble and/or player movement in one direction then pass against the grain and against the defensive movement. In the diagram below, Player 1 pitches to Player 4. Player 4 takes one or two dribbles to the right then throws back to Player 1. The ball and player movement to the right would pull the defense in that direction. The mix pass from Player 4 back to Player 1 would be against the grain of the defensive movement. At 1:02 in the above video, the Bulls demonstrate Pitch Mix Angle where the pitch is followed by the throwback pass. On the flight of the throwback, the interior player races into an angled step-up ball screen. Click the image below to add Pitch Mix Angle to your FastDraw playbook. If the defense is able to take away the mix pass, the ball may be entered to Player 5 at the elbow setting up a back cut into a handoff (Frame 4 and at 2:10 in the video above). 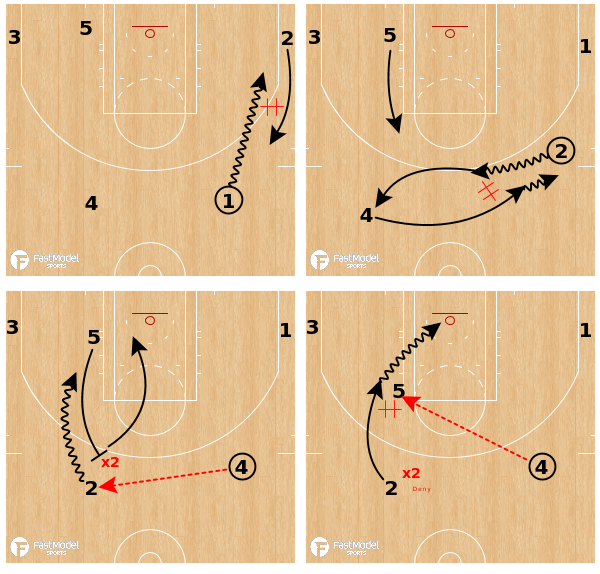 The Bulls also initiate with a dribble handoff to the ball side wing (flip). 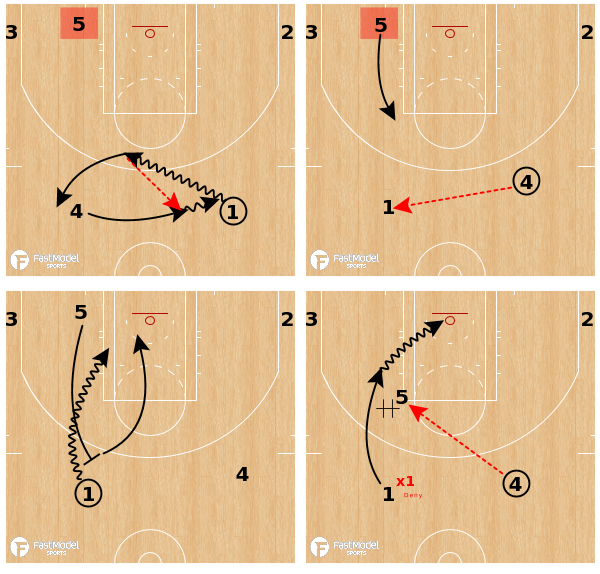 The video below features Flip Get where the dribble handoff is followed by weave action then a pass-and-follow wing ball screen. At 1:23 in the video above, the Bulls demonstrate Flip Mix Angle. This sequence is similar to Pitch Mix Angle. There is the ball side flip, the weave action and then then mix pass against the grain. On the flight of the throwback, the interior player races into an angled step-up ball screen. Flip Mix Angle is also a way to get a guard other than the point guard involved in the high ball screen. Click the diagrams below to get Flip Mix Angle into your FastDraw Playbook! If the defense is able to take away the mix pass, the ball may be entered to Player 5 at the elbow setting up a back cut into a handoff (Frame 4 above and at 2:09 in video above). Here are some bonus videos! First is Flip Jersey – a clear out option beginning with a flip. It features misdirection plus a back screen lob opportunity. Next, this clip features #RAMP program Bergen Catholic (NJ) scoring with Pitch Get from Hoiberg’s Pitch Series. And lastly, some clips from Iowa State demonstraing various sequences from the Pitch Series during Hoiberg’s time there. For help with practice planning and implementation of an early offense attack featuring these or other offensive elements for finding, using and creating offensive advantages please contact us and/or join our community for basketball coaches!